This was a mini skirt I found at a thrift store. It was the embroidered cotton that caught my attention. I don't really wear short skirts though so I thought I would make this into something I'd use more. 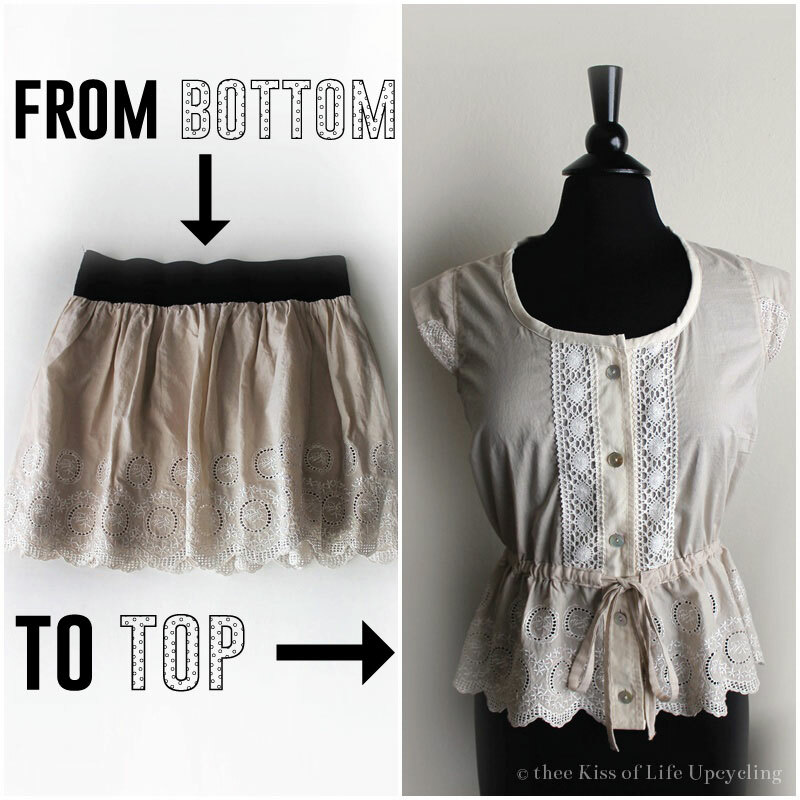 The skirt was in excellent used condition and fully lined, giving me a good amount of material to work with. It wasn't enough material. I had to work in another article of clothing. A blouse, not in exactly the same color but in the same family. 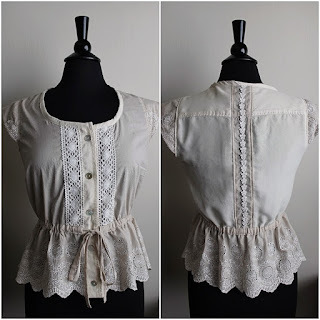 The condition of the blouse was okay except for fraying holes around the pockets and armholes. The fabric is beginning to thin...I could see why someone had donated it. It does have darling details on the pockets and collar though. I'll use those too but on something else. This embroidered cotton blouse is one of my favorites. So I chose to copy it for this upcycle. 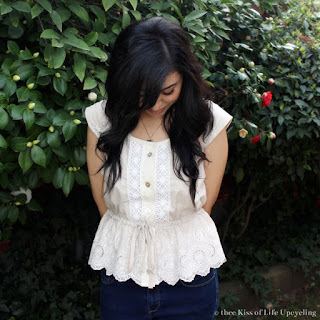 Beside all the floral and eyelet details, I just love the peplum. Your existing clothing make the perfect pattern, you already know exactly how it fits. Just give it a seam allowance all around the pieces. I like to think I made it all work, piecing things together. I also added some cotton lace trim to embellish the top front and a cotton flower trim to the top back. The leftover elastic from the skirt will be used some other time. Is it cheating that I used the whole button plackets, with the buttons already sewed on and everything? Lol.